The boy gets hungry after taekwondo. And before taekwondo. And probably during taekwondo. And at a whole host of other times during the day. He's a growing boy and eats like one! We do a lot of simple snack boxes throughout the day to keep him hopefully semi-full and at least eating healthy. After his taekwondo class, he often has to wait for our class (another hour), then the drive home and dinner prep (another hour total) to eat, so it's a delicate balance between bringing him a full dinner or just a good healthy snack. This time, we opted for a nice healthy snack. He has a parmesan zucchini muffin, topped with a cute cheddar bunny (sugar eyes, mozzarella nose). He has some deli turkey rolls, with a few of his favorite picks to hold them in place, and a mixture of fresh berries (strawberries, blueberries & blackberries) plus purple grapes. Lots of his favorites in this box. And a cute Ben story--at church the other week, they made collages of their favorite foods (maybe something related to feeding the multitudes with 5 loaves/2 fishes?). Anyhow, Ben comes home with his, with the typical pictures of cookies, ice cream, and ... a zucchini. Zucchinis are his favorite vegetable you know. Where do you get the picks? I found some with hearts but that is all I've found. Yours are always so cute! I'm pretty sure boys just never stop being hungry! I think Kidlet would fall asleep with food in his mouth if I let him :P Snack looks cute and delicious! Mommy Moment - try a party supply store for seasonal picks. Shannon - I had trouble linking with the What's For Lunch Wednesday, but it worked the 2nd time! Hi! I'm sorry I dont't speak very well english (I'm french!) 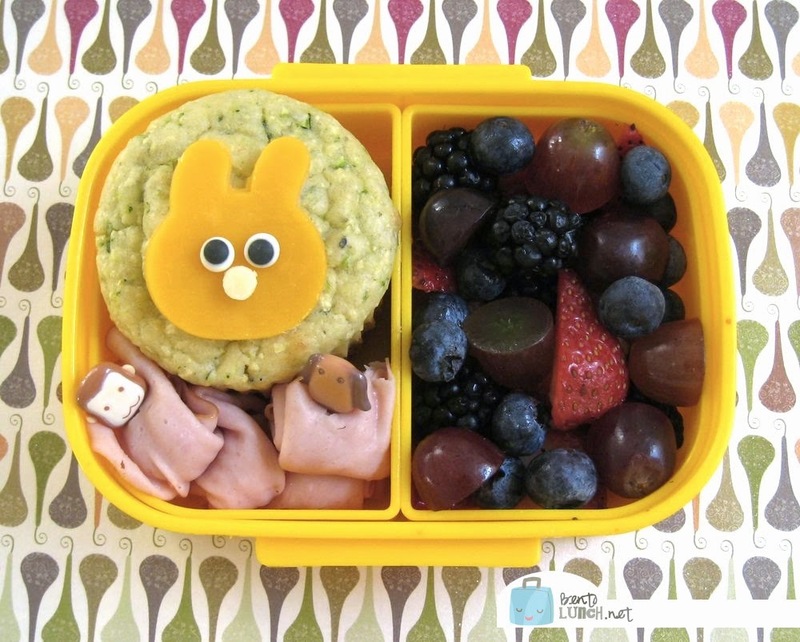 Your bento is so cute I love this! Those picks were from California, a friend brought them back for me. We have a few little stores in Dallas, but nothing to the extent of CA. Wilton usually has cute stuff available at regular craft stores. ~julybentos Bienvenue! J'adore rencontrer les nouveaux amis de bento!